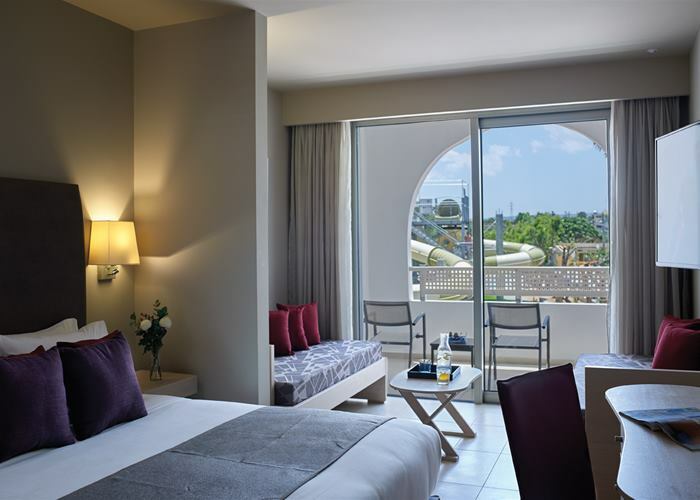 Atlantica Akti Zeus is located on the beachfront of Amoudara in Crete, so suits whether you are a pool or beach lover. 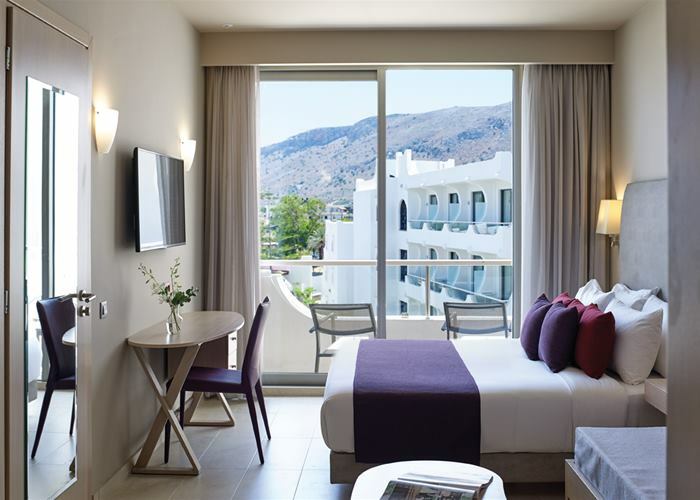 With a head to toe makeover, this hotel offers stylish accommodation choices from rooms just for two through to family rooms with a swim up pool right up to your doorstep. If this is just not enough, enjoy unlimited access to an unforgettable holiday experience at the hotel’s waterpark. 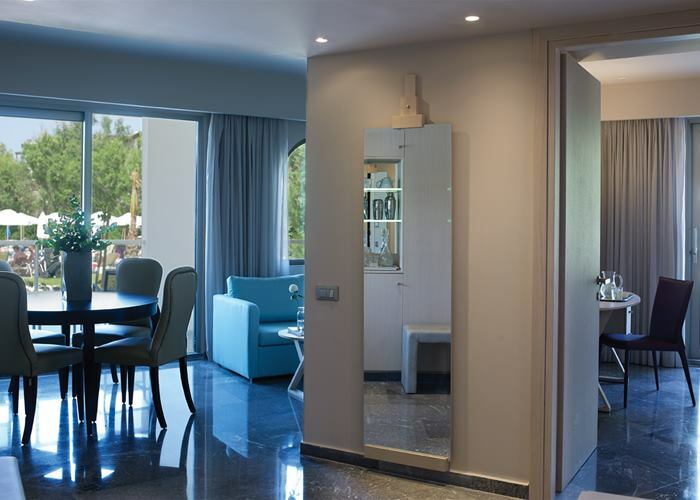 These elegant rooms are ideal for two and come with balcony or terrace. 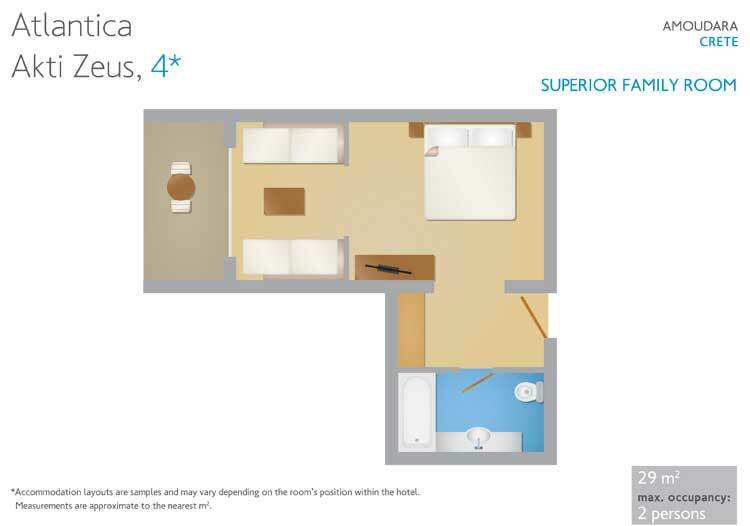 There's ideal holiday space with a double bed or two singles and are located within the main building. Room comes complete with LCD TV and air conditioning for your comfort. 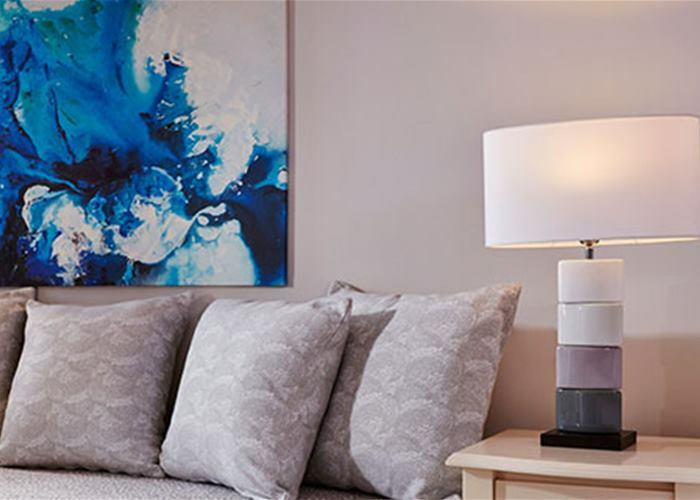 Cozy up in this luxuriously comfortable double room perfect for three. 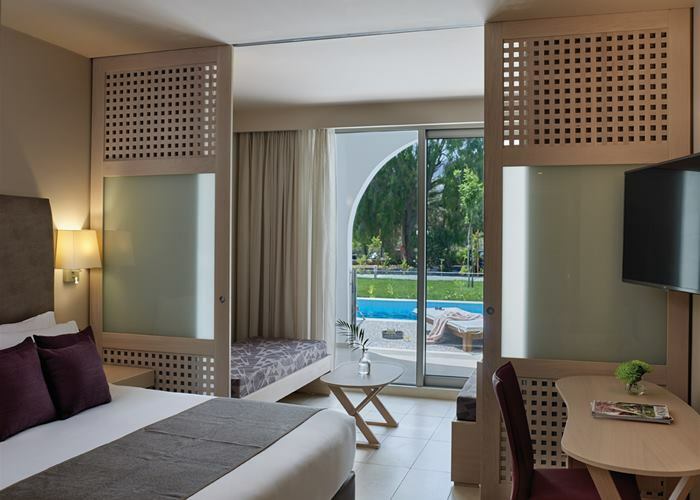 These spacious and tastefully decorated rooms come with double or twin beds and an extra bed non-permanent armchair bed. 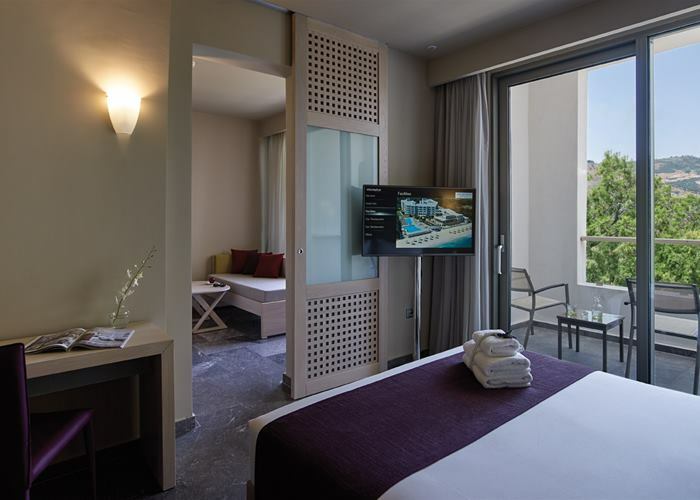 This room type comes complete with an LCD TV and air conditioning available throughout the season and a balcony or terrace. These stylish rooms are well designed for maximum comfort with double or twin beds a sofa bed and a roll-out bed in an open plan arrangement. 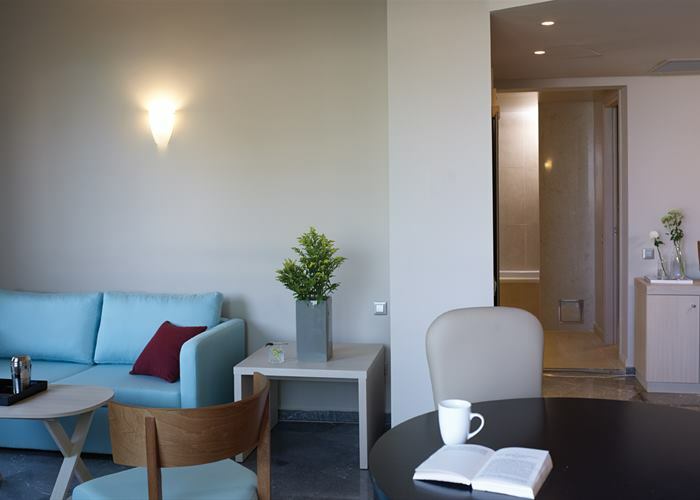 The room sleeps up to a family of four and come with an LCD TV, air conditioning and a balcony or terrace. Baby cot space is not available within this room type. 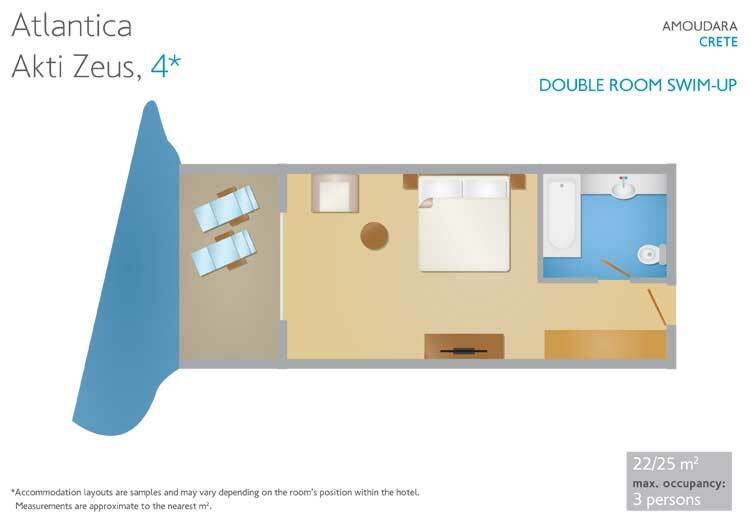 Loosen up in the comfort of your own room with footsteps apart from your swim up pool. These stylish rooms are fresh and inviting and sleep up to 3 people. 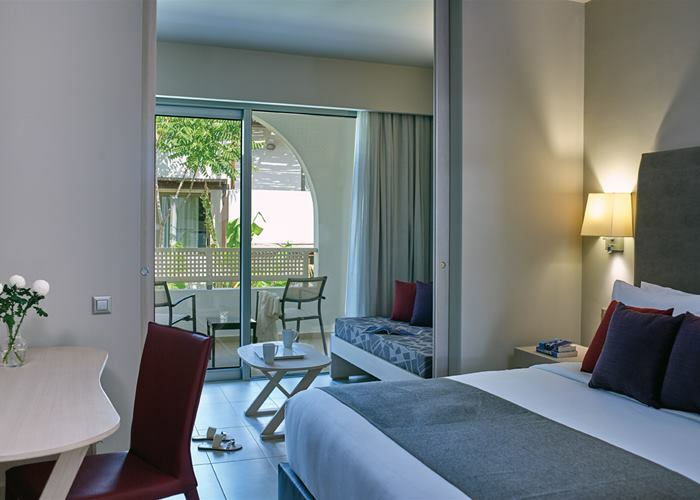 They have the added benefit of your own sun loungers on the terrace, LCD TV and air conditioning. Baby cot space is available on request. 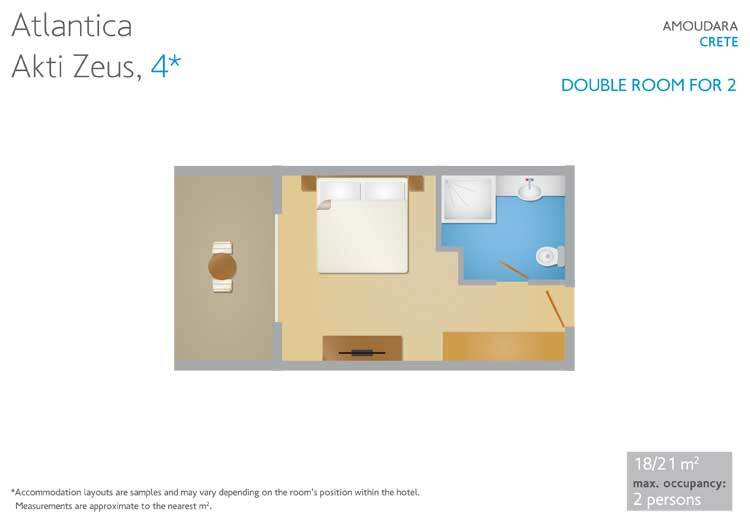 Family rooms combine practical family space along with relaxing comfort for both adults and children. 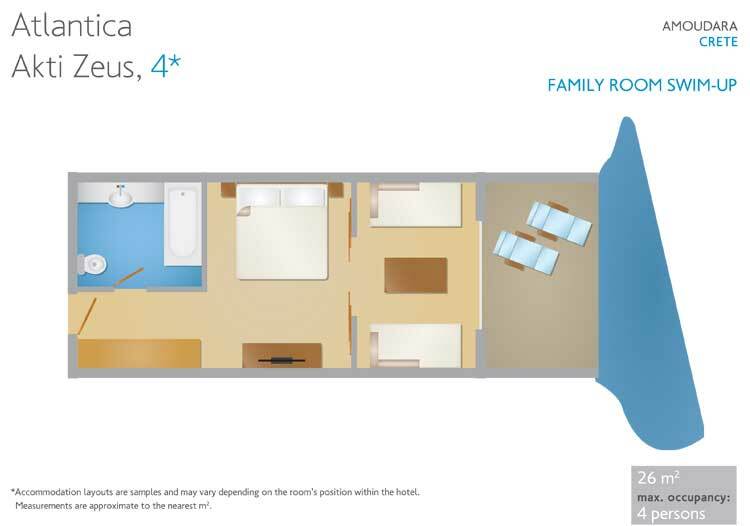 They sleep up to 4 people made up of one double bed and two sofa beds in an area partially separated with sliding doors or without sliding doors. 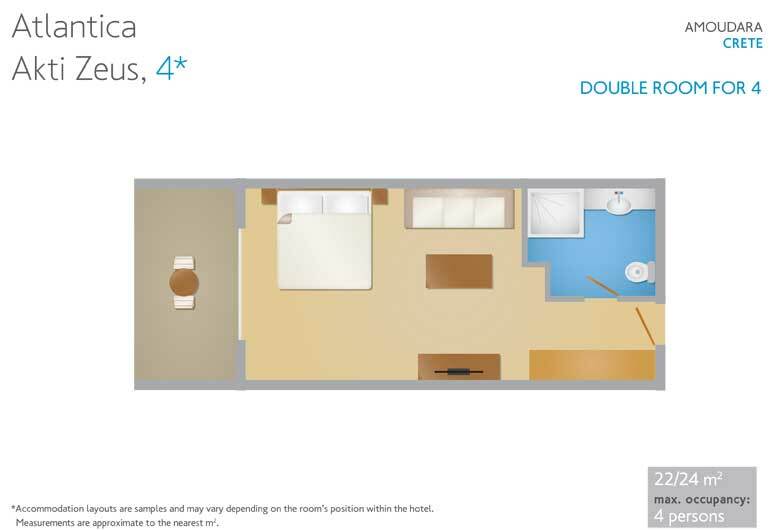 Rooms come complete with an LCD TV and air conditioning. Baby cot space is available on request. If you love spending the day in the hotel pool, you can do much better than staying in your own private swim-up room where it is possible to dip into the pool right from your back door. 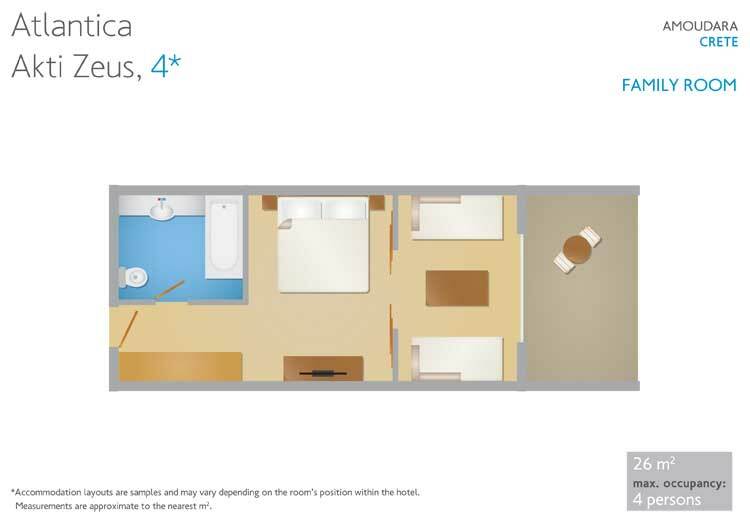 This room type can sleep up to 4 people made up of one double bed and two sofa beds in an area partially separated with sliding doors or without sliding doors. Rooms come complete with an LCD TV and air conditioning. Baby cot space is available on request. From the moment you walk in the door, you'll feel right at home. 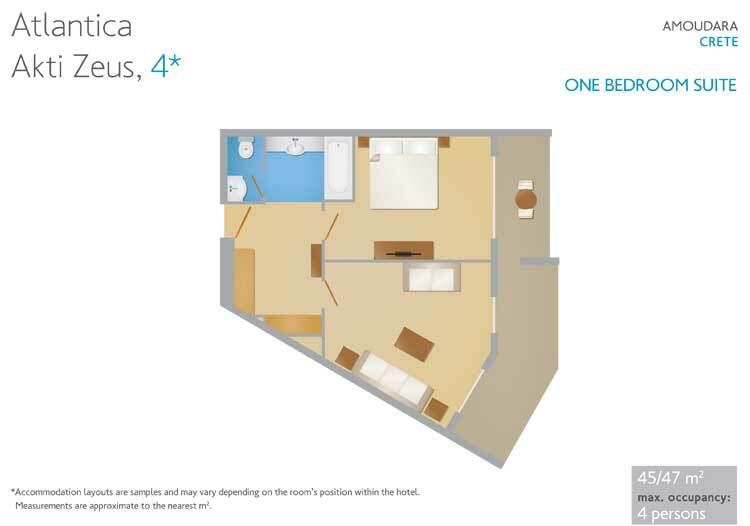 There's a separate bedroom with double or twin bed and a living room area that can sleep up to two people. This suite has all the comforts and privacy giving you the homely feel that you sometimes need on holiday and comes complete with an LCD TV and air conditioning. Baby cot space is available on request. 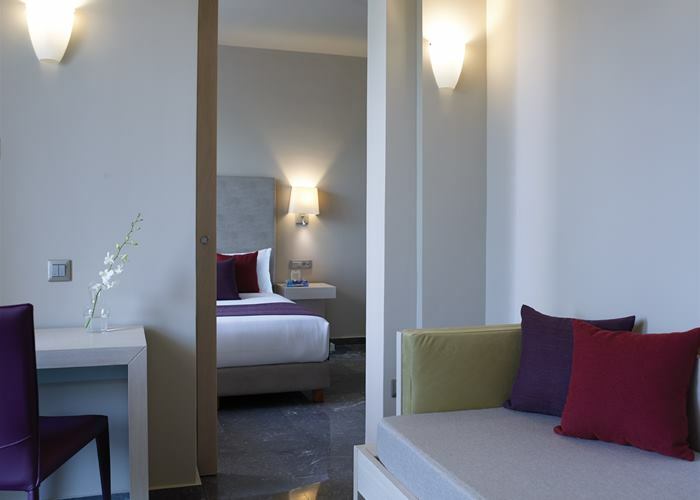 For a pleasant stay you can count on our tastefully furnished and spacious Superior family rooms. 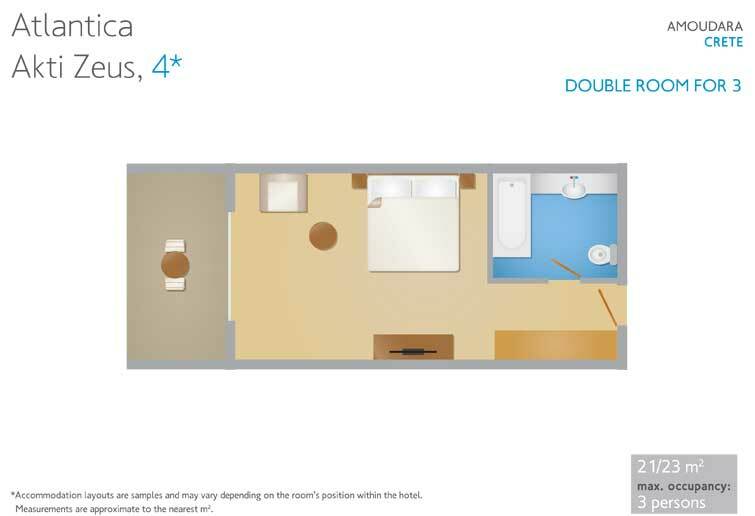 These rooms come with a double bed and two sofa beds in a separated enclosed room giving you complete privacy. Rooms come with an LCD TV and air conditioning. Baby cot space is available on request. 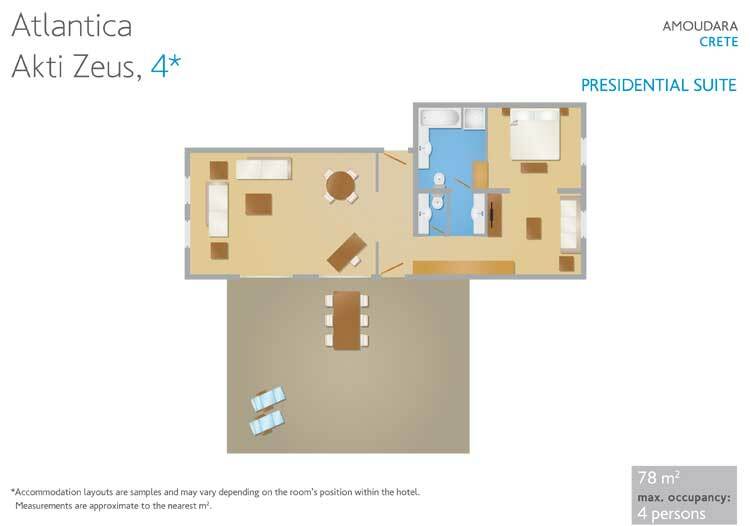 For the ultimate in exclusive luxury, the Presidential Suite delivers a truly memorable experience. This room comes with a double bed in a bedroom with a separate enclosed living area, living room with two permanent sofa, dining area and private furnished balcony.